There was a time, back in the dim and distant past, when I was rather sniffy about high-end Indian food. It started, I think, with a rather unsatisfying experience at Benares in Mayfair, where I had a couple of little bowls of curry, some quite nice chicken tikka, and some mini poppadums and was charged about £45. Then not so long after I went to a blogger's dinner at Tamarind, which though better in terms of variety still felt a bit half-hearted, shackled (I thought) by the constraints of Michelin-starred dining when Indian food should be all about fire, spice and immediacy. The thing is, I have a feeling that both of the above - Benares and Tamarind - were even at the time much better than I gave them credit for. Being a hopeless devotee of noisy canteen restaurants like Tayyabs, Lahore and Mirch Masala, I probably regarded the soft furnishings and silver service of the high-end as missing some vital element of heart and passion, as if whatever it is that makes Indian food so good couldn't possibly thrive next to fine wines and tablecloths. Which is of course, not only completely wrong but slightly patronising. The French can have Arpege as well as their local bistros, the British can have Fera and a pie and mash shop happily co-existing. So why can't Indian/Pakistani food be just as much about tasting menus and fine dining as it is about queueing in Whitechapel for a mixed grill? The only worry is that with new kids on the block Gymkhana and Trishna stealing all the awards, press and limelight, stalwarts like Westminster's Cinnamon Club can too easily be overlooked. But I am pleased to report that every table in this beautiful old library was taken on Tuesday night, and for good reason too - the food, every bit of it, from start to end, was absolutely superb. That's not to say everything about the evening was perfect, however. Staff were a little thinly spread, and flagging them down for drinks was occasionally tricky. Martinis used room-temperature glass, meaning by the time they'd got to the table they were approaching lukewarm, and I think even though we were happy to plough our way through the £75 tasting menu (it was a Tuesday after all) it would have been nice for them to bring naan breads and chutneys without us asking. But all the niggles were answered with things like this - king scallops with cauliflower and sumac couscous, perfectly crusted and packed full of flavour, texture provided by crumbly veg and a lovely dollop of sweet chutney. And this - a moist, charcoal-grilled partridge breast, with a fresh raita and some expertly dressed salad. When the dishes first appeared your first reaction is one of slight disappointment; presentations seem dated and lazy, just thrown on a plate then sent out. But the flavours and techniques make up for it in spades - these are top ingredients treated with care and with a masterfully subtle command of spicing. How else, for example, would you explain how a cube of chickpea with coriander chutney and spiced yoghurt was almost the highlight of the entire meal? 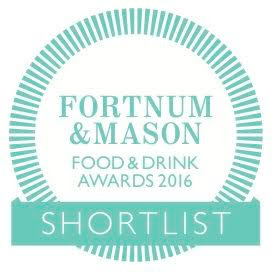 Beguiling flavours and wonderful textures creating a single exquisite mouthful of joy. "I could eat about thirty of these I think" my friend said, as we were polishing up the leftover spiced yoghurt with our fingers. King prawns with shallot raita again looked like nothing much special on the plate, but had been grilled to perfection, containing moist bouncy flesh and a deep, earthy spice mix. A palate-cleanser of mint and lime sorbet (no complaints) came before a fillet of sea bass, a good crunchy skin covering soft, moist flesh. Underneath, curried chickpea and chorizo was like a fine, slow-cooked Indian cassoulet. Technically precise, but also packed with a balance of flavour that meant you never wanted it to end. Roast venison with black stone flower and onion reduction combined classical French techniques with a few slices of perfectly moist deer loin, and some crunchy bits and pieces of root vegetables. Of all the dishes this was perhaps the most straightforward, but was still nearly impossible to fault - if you can't enjoy pink venison, roast potatoes and a thick reduced onion sauce, then there's surely something wrong with you. I'm not entirely sure how to describe this - it was sort of a cross between yoghurt and cream, but was quite grainy in texture. In fact I didn't like it much, although the rice crispies were quite nice. This sticky toffee pudding - sorry, spiced apple pudding - was more like it though, caramely and rich with a nice rich cinnamon ice cream on a little circle of brandy snap. I've never really had a dessert worth writing home about in an Indian restaurant, so the fact they've decided to go down the traditional English pudding route is understandable. I loved it. And I loved much of the rest of it. OK, asking for bread was a bit annoying and I could have done with a colder martini but when you leave a restaurant grinning from ear to ear and determined to do it all again the first chance you get, you know you're onto a good thing. £115+service is not a trivial amount to spend on dinner, not by a long shot, but if you consider it's 10+ courses with about 8 glasses of wine, well, it's not really a ripoff either. This fine old institution is just a new set of tableware and a glass freezer away from being unassailable. Or perhaps the 90s stylings are part of its charm. Either way, here's to another 10 years. I wasn't invited to the Cinnamon Club but for various reasons we didn't end up paying . Mentioning it here in the interests of full disclosure anyway. The last few years have not been kind on high-end French dining. Thanks partly to an explosion in demand for budget American comfort food (MeatLiquor, Patty & Bun, Chicken Shop) and a determined democratisation of the mid-range elsewhere (Zédel Brasserie, Zucca, Bone Daddies, you name a cuisine, you can eat it in this city for about £20/head), all of a sudden places like Petrus, Alain Ducasse, Gordon Ramsay and (yes) Marcus at the Berkeley hotel seem part of an older, fussier, elitist tranche of expense-account sinkholes, not irrelevant as such but not exactly London 2014. So not to take their increasing marginalisation sitting down, Gordon Ramsay Group opens the Kitchens (Bread Street Kitchen, and the forthcoming Heddon St Kichen) and Marcus Wareing opens the Gilbert Scott, each an attempt to win a slice of the casual dining middle ground. I say casual, but really these places are only casual in comparison to the multi-Michelin-starred flagships - the bill at Bread Street kitchen can easily top £50/head, and the Gilbert Scott is even more arch, albeit serving interesting British staples in the stunning surroundings of the St Pancras Hotel. I quite liked the Gilbert Scott, but still very much got the impression that Wareing's heart really wasn't into steak and chips, or charred butternut squash for that matter. But if the Gilbert Scott felt a bit like something Wareing thought he should do rather than something he really wanted to do, the menu at Tredwell's is even more knowingly departed from the the brand, being a jumble of hipster ingredient buzzwords (kimchee, chipotle, pulled pork, beef short rib - if it's had an article written about it in the Guardian, it's here) served as "small plates" (but of course) in a variety of inappropriate tableware. Because hey, isn't that what all the cool kids are doing these days? 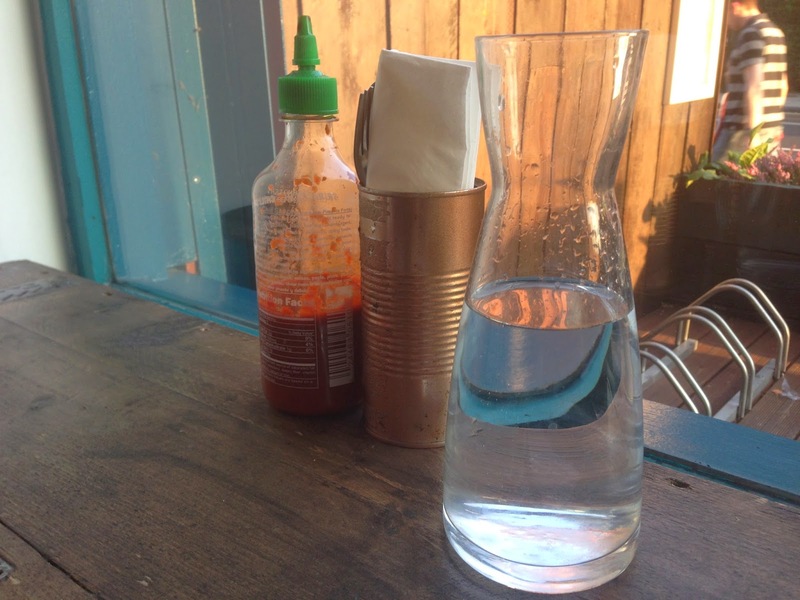 The concept is self-conscious and vaguely annoying, then, but that wouldn't matter so much if the food had been good. But though (in the main) it was all quite *precisely* cooked, with no glaring errors, at least not in the selection we ordered, there was no sense that this menu was really what anyone - not Marcus, not his executive chefs, not the staff - really wanted to serve. A £4 bowl of dry feta (almost impossible to spear with the little pickers as they just crumbled into ever tinier bits), ordinary olives and teeny bits of sun-dried (or somehow preserved tomatoes) was a bit like something you can get from Waitrose. Clearly someone felt that they had to serve a bowl of olives and feta, so here it inevitably is, but what good did it really do? Chicken liver mousse I think had been squirted out of one of those foam-gun gadgets, and was prettily folded on top of a layer of bacon jam (+1 hipster points there) inside a kilner jar (+1). The charred sourdough bread it came with was lovely, perfectly moist inside and with strong black grill marks, almost worth ordering the dish just for that, but the mousse was decent too, very light and with a smooth, pleasant flavour. I'd been told to order the "Smoked sticky chili chicken thigh", and so dutifully did, but couldn't really see what all the fuss was about. The smoking had made the flesh of the chicken quite friable, and the meek flavour of the meat was overwhelmed by a thick, sugary glaze. Unambitious and lazy, it was a bit like something you'd get as part of an 'Asian sharing plate' in a basement Covent Garden nightclub. Seabass was, against all expectations by this point, perfectly cooked, all the more surprising considering the thinness of the fillets. The carrot purée and lentils it sat on could have done with a bit more seasoning, and I'm not sure why this was best served in a lipped ceramic bowl rather than, oh I don't know, a plate, but at least it had a nice crisp skin and moist white flesh and that's all I ever ask of white fish. £14 though - not the bargain of the century. There were a couple of sides we ordered mainly out of curiosity. "Cauliflower, sprouts, hazelnuts & Berkswell cheese" should have been lovely, except the vegetables tasted boiled rather than the much more exciting grilled style that's more normal lately (see, some restaurant trends are worth following), the hazelnuts were either very gently toasted or not toasted at all, and the overall effect was, well, like a bowl of cauliflower cheese. Kale slaw was so thinly-seasoned and boring I can hardly remember eating it at all. Fries were good. Yes, I think the fries were good. With a couple of glasses of the cheapest fizz and a New Fashioned cocktail (which tasted very nice but I always think using dried fruit is a bit lazy) the bill came to £86.06. Which isn't a fortune in the grand scheme of things, but still - for a meal so entirely unambitious and unmemorable it's still £86.06 too much. Everything felt crowdsourced and focus-grouped, the product of market research rather than individual creativity. All head and no heart. Service was fantastic, and yes I was invited and they knew I was coming but believe me this is still no guarantee; our waiter at Tredwell's was pleasant and charming, a veteran - I got the strong impression - of Wareing's flagship 2* place at the Berkeley where his easy style and attention would compliment any tasting menu perfectly. Serving chicken wings and chips seems rather a waste of his talents, another awkward example of a group of people doing something they think they should. But look, the point is, there's absolutely no shame in being high-end, if that's where your interests lie. Marcus Wareing is objectively an incredibly talented chef, and his restaurant at the Berkeley is by all accounts, (and even since the self-conscious renaming MARCUS and removal of tablecloths) still a wonderful place to go for a meal. Why not be happy with that? Forcing yourself to go 'down home and dirty', chasing the comfort food dollar in Covent Garden next to Hawksmoor and MeatLiquor is like an eldery uncle wearing his baseball cap on backwards and listening to Taylor Swift. It feels forced, and contrived, and uncomfortable. And I'm afraid I didn't enjoy it very much at all. There's always a risk in expanding a restaurant abroad that there will be some aspects of your style or facility, happily accepted as normal in your home country, that will not sit well with your new audience. TGI Friday's, for example, has become notorious for the kind of gurning over-familiarity of service that British people dismiss as "typically American" but which presumably great swathes of the US consider perfectly satisfactory. And at the other end of the scale, the typical level of "service" encountered in a huge number of high-end Parisian cafés would be considered nothing short of abusive anywhere else. In fact, I'm pretty sure even in Paris they're not very happy about it most of the time. The trick, then, is to translate your restaurant abroad rather than just create a carbon copy of it and print the menu with a different currency. Shake Shack, for example, have had success in their new Covent Garden home by keeping the same what works back in NYC (the burgers, fries etc) whilst cleverly tailoring the fringes of the menu with local producers (Kernel beer, Paul A Young chocolates). And let's not forget arguably London's best steakhouse Goodman is a Russian's idea of a New York restaurant, which works in its Mayfair location thanks to a European wine list, a fantastic range of UK & Ireland beef, and friendly - though crucually not TGI Friday's-matey - staff. 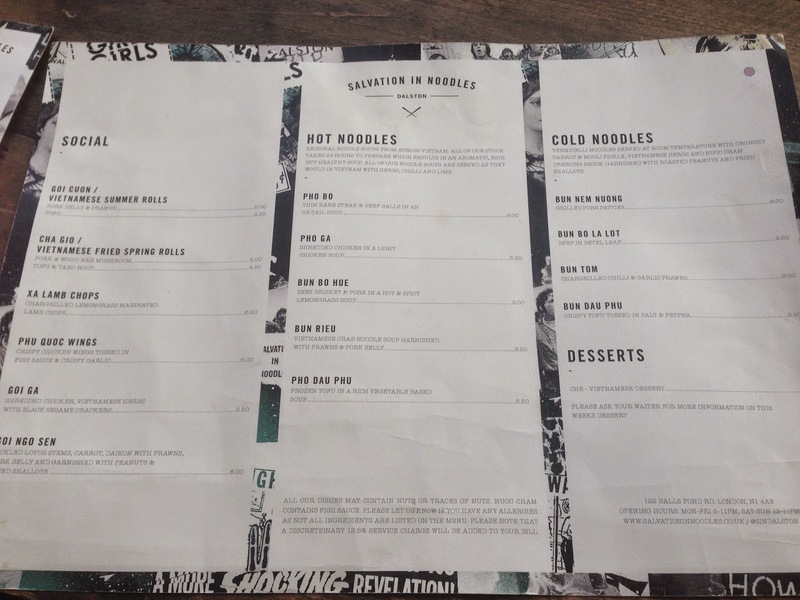 So what to make of Ippudo. Maybe everything they're doing in Singapore, Sydney, New York and the dozens of other branches around the globe is perfectly in tune with the needs and sensibilities of the local population. Perhaps Indonesians like nothing better than to be paraded through the restaurant on arrival like contestants on a game show while twenty members of staff scream unintelligable Japanese in their faces. Perhaps in Seoul, being pestered with questions ten times a minute is the very finest way to enjoy your faintly mediocre and overpriced dinner. And there's even a chance that in Taipei it's normal to be asked how various dishes are before you've even had a chance to taste them. But not here, guys, not here. Not now, and not ever. Ippudo is completely and utterly insufferable on many levels but even if the food had been any good (it wasn't) it would have been hard to objectively rate it apart from the experience of eating there, which has to rank alongside a root canal in terms of comfort and relaxation. It's not just the stupid welcome parade, which is ear-burningly embarrassing for all concerned. It's not just the constant, intrusive badgering about this and that, from all sides, like trying to enjoy your dinner whilst undergoing a driving theory test. No, more than all that, it's just that like so many theme restaurants that have opened in London over the years, it all feels so tragically hollow and stage-managed, obsessed with stupid theatrics and entirely devoid of heart. What's more upsetting is that I really was expecting to enjoy it. Let's face it, London has been on a bit of a roll recently with ramen joints, to the extent that I was beginning to suspect that ramen was pretty easy to get right all along and a lot of people were making a fuss over nothing. And in fact, the ramen itself was one of the few things at Ippudo worth the money they were asking for it. It wasn't great, by any means - cold, crumbly pork topped a creamy, rather one-note broth, and the noodles had none of the taste or bounce of Kanada-Ya - but it was comforting in a straightforward kind of way. But the rest of the food ranged from odd to bizarre, stopping at weird along the way. House pickles came in a little glass bowl containing some strange sweet liquid, some raw (ie not pickled) and bland cherry tomatoes, and a great big sprig of flat leaf parsley. Oh and a bit of lemon. For some reason. Chicken kara-age were greasy and soft, with none of that light bubbly coating I'd come to expect from versions at Tonkotsu and Sasuke, and were only really eaten (accompanied at all times, remember, by the constant background natter "is everything OK?"... "do you like your chicken?"... "can I take that plate away?") because they were there. Sesame prawn toast were a disaster, soft and so drenched in grease they immediately brought on a gag reflex. As to why they were accompanied by lime ("do you like your sesame toast?") and another massive sprig of parsley ("can I take that plate away now? "), well... who knows. Zuke-maguro was a plate of dull Itsu-level sashimi salad ("would you like another beer?") with some admittedly quite nice soft boiled quails eggs ("would you like another napkin?") alongside some, er, radicchio and asparagus. Obviously very weird, but not as weird as a kale, asparagus, blueberries (? ), cherries (!? ), nuts, balsamic and olive oil concoction we spotted on the menu. OK, there were some things that weren't terrible. Sesame cucumber was very enjoyable, and presented very nicely. Gyoza were ("can I take that plate away?") properly fried on one side and contained a good, moist, porky filling. And ("is everything OK with your gyoza?") the hirata buns were good, but still not as good as the ones from Yum Bun or Bao London, and considering Ippudo invented the damn things that's not a particularly strong endorsement. And all the time the interruptions, the chanting, the noise. I'm all for enthusiastic service but I don't want twenty people screaming their approval every time I go for a piss, and I don't get the impression this was first-fortnight nerves (Ippudo has been open since 2nd October). I can only assume this is how they mean to go on, and that the humiliating parade-shouting in and out, the bizarre food and the overattentive-to-the-point-of-mania service are all "features" that have made Ippudo so inexplicably popular with those short of attention and hard of hearing the world over. Well, at least I can say I've tried it. And with better ramen available so easily elsewhere, I can definitely say I won't be back. "I don't care how warm it is outside," said my friend as the mercury topped 20 degrees Celsius at the start of October, and the sun cracked the pavements on the streets of Battersea, "I'm wearing my winter coat. I've waited long enough." I know how she feels, although not about clothes, which as anyone who's ever met me will not be surprised ranks just between reality TV and cross-country skiing on my list of interests. My problem with the Indian summer is that I have been waiting far too long to snuggle up to a bowl of ramen or a portion of spicy tom yam soup and it's got to the stage when I'm prepared to sit sweating in wildly unsuitable conditions to do so. So as my friend headed off for the Central Line in four layers and fake fur, I headed to Kanada-ya, ramen specialists from Yukuhashi (Japan), Hong Kong, and now St Giles. As fate would have it, by the time I arrived at this busy spot on the corner of New Compton St, the weather was trying its best to be autumnal. Though not particularly cold, it was thrashing down, and those taking shelter inside were softened by a fug of steam from wet umbrellas, wet clothes and hot ramen. Seating arrangements are, to put it politely, convivial - I was placed somewhat awkwardly on a tiny table in the corner close enough to knock elbows on more than one occasion with a young couple next to me, but this is I'm sure all part of the experience - in the nicest possible way you aren't encouraged to linger with your laptop at Kanada-Ya; you enter ("irasshaimase! "), you order, you eat and you leave. You can't really linger over the menu, anyway, as it's so tiny. Just three different styles of ramen, a few optional toppings and a small selection of onigiri which I saw precisely nobody eating. You order by putting the number of each item you need in the box next to it on the menu. At least I think this is the idea; it's what I did and it worked. From that point on if you need anything else you just ask a waitress (in a room the size of a telephone kiosk they're never far way) which does rather beg the question why you need the ordering card in the first place. I sometimes get the impression that more often than not the odd tweak or two to the original concept as a nod to local tastes, and without "selling out", would make things run a bit smoother. But I'm sure I'm not the expert. The good news and for most people all that really matters, was that the ramen was excellent. Unfortunately I'm not entirely sure which one I had. I definitely put a little '1' next to the box for Chashu Men (£12.50), which has an upgraded "deluxe" pork instead of the usual pork belly, and the £1.80 option of Hanjuku egg. But my bill at the end said Chashu Regular with Hanjuku Egg, for a combined total of £10, so who knows what I actually ate. Even the Japanese lemonade in a weird old fashioned bottle with a glass ball rattling around inside it came in at half price. Maybe the prices depend on how guilty they feel about where they've asked you to sit. But thanks to a thick, creamy broth, a massively generous helping of tender pork fanned out around the edges of the bowl, and hugely complimentary mounds of wood ear mushrooms and spring onions, all problems were soon forgotten. This was impressive stuff, clean, crisp flavours that are better described as familiar and comforting than anything so insulting as "straightforward". Another complication during the ordering was being asked how I liked my noodles, and being blindsided somewhat with this question (it's a first for me in a ramen joint) just stammered "er, normal?" and hoped that would suffice - fortunately she seemed happy enough with that. 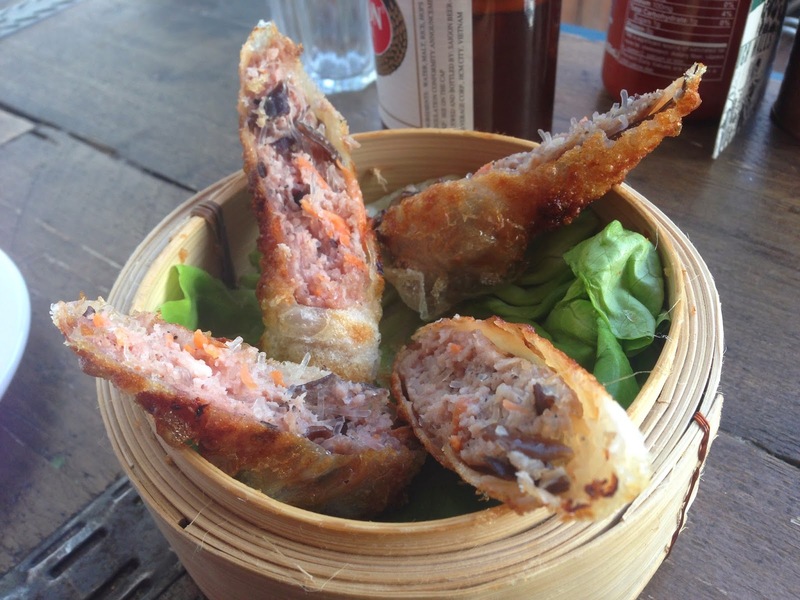 They were lovely things, firm and springy and with a savoury, earthy taste of their own. And you'll be able to tell from the photo how good the cured egg was, salty and silky with a perfect runny yolk. It probably isn't helpful to pitch the ramen joints in London against each other like it's some kind of knockout competition, so I won't. The fact is, each of the premier league contenders (Tonkotsu, Bone Daddies, Sasuke, Shoryu) have something to recommend them, and you can't really go far wrong. All that you need to remember is that Kanada-Ya deserve a place amongst the top flight, and very much deserve your custom thanks to serving excellent pork broth ramen at a very reasonable price indeed. Enjoy - no matter what the weather's doing. 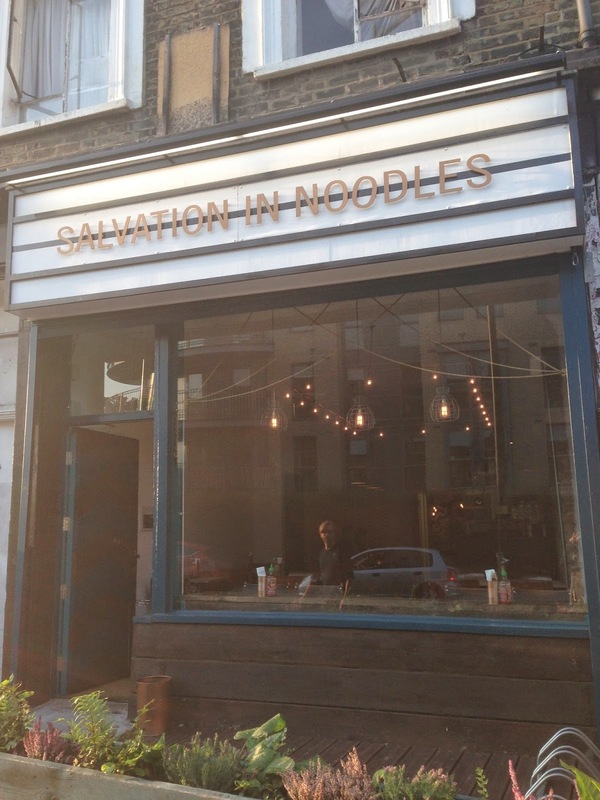 Opening a Vietnamese noodle shop in Dalston has, it must be said, a touch of the coals-to-Newcastle about it. The main thoroughfare in this part of town is Kingsland Road, home to a huge number of Vietnamese restaurants, many of them extremely good (the Viet Grill is, and always has been my own favourite) and most of them able to knock up a comforting bowl of Pho faster than you can say Ăn ngon nhé. But I've said it before and I'll keep saying it until (and until well after) you're all entirely sick of hearing it, there is no reason to complain about somewhere being a bit derivative, or flaunting a familiar concept, if the end product is decent and value for money. Not everywhere can be, or needs to be, stunningly original, and anyone boycotting, say, Clockjack Oven because it's a bit like Chicken Shop, or avoiding Dirty Burger because you've already been to Patty & Bun, risks diddling themselves out of some very nice food indeed. 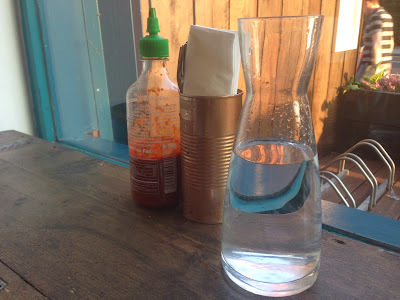 Anyway, speaking of Dirty Burger and Chicken Shop, I'm reliably informed the very same brains (Nick Jones' Soho House) are behind Salvation In Noodles on Ball Pond Road, and you can see some of the family resemblance in the garden shed interior and clean, pared-back menu. 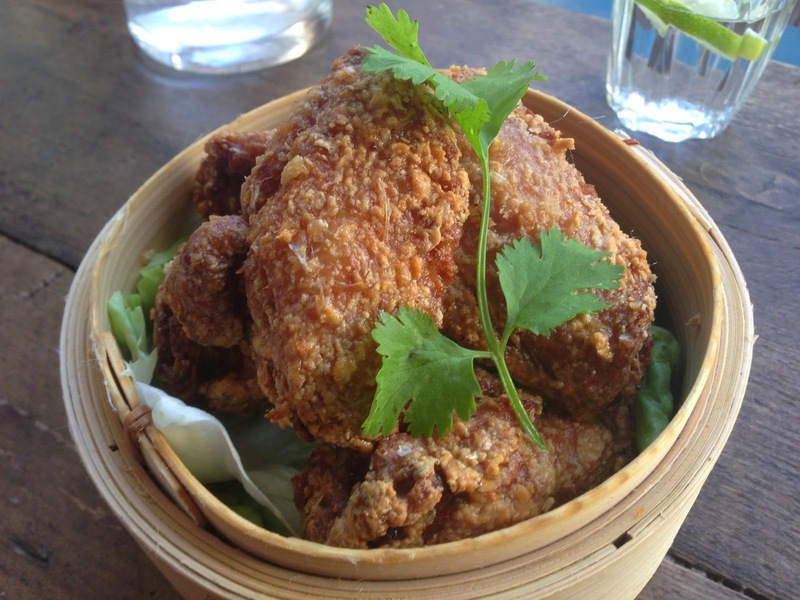 The Soho House group certainly has its fans, and its detractors, and while there are clearly better places in town to get chicken and burgers both, I've never left any of their branches disappointed. SIN seems to be aiming for a similar level of comfortable competence. Chicken wing starters had a very (perhaps a bit TOO) crisp skin but contained piping hot, moist flesh and had a good amount of those fragrant Vietnamese flavours (garlic, fish sauce). Fried spring rolls were slightly less successful - a thick, rough pastry had swallowed up a lot of the cooking fat, meaning they were rather soggy - but the flavours again were good (nice and porky) and I liked the sweet & sour dipping sauce they came with. 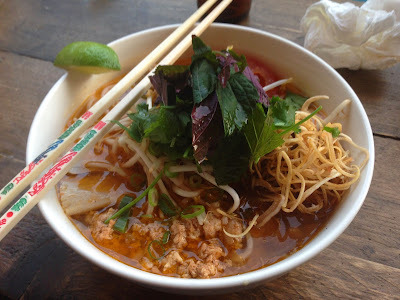 Noodle soup is really what you come here for though, and Bun Rieu was worth every bit of the £9.50. In a vast bowl of complex, beguiling stock floated brown crab meat, slices of incredibly tender pork and some huge, bouncy-fresh prawns. Fresh herbs and vegetables added texture and SE-Asian aromas, and whilst I have had slightly better noodles once or twice, for the price and considering the generosity with the seafood, you really couldn't complain. 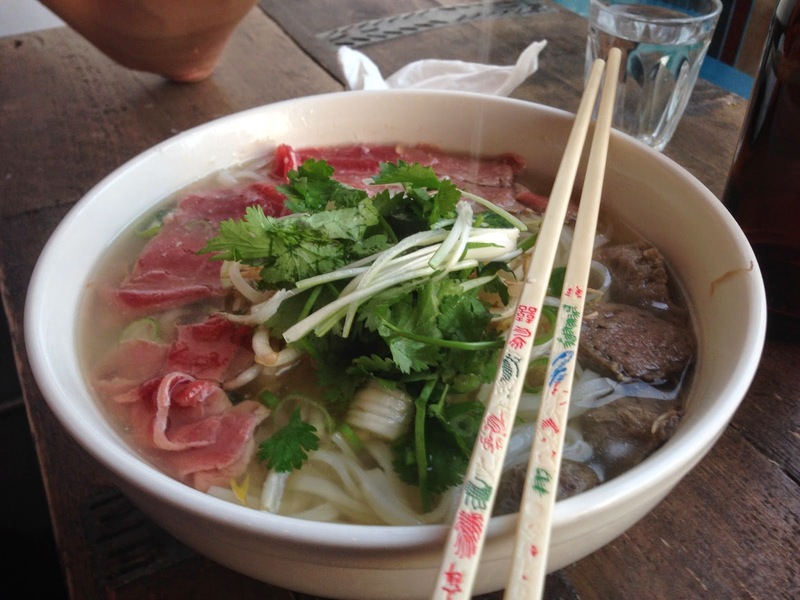 The beef version (Pho bo) was just as successful. Thin ribbons of pink steak slowly poached to grey as you work your way through more lovely stock, springy beef balls, and another generous pile of noodles, herbs and vegetables. Again, it's not the greatest Pho in London but it is certainly nowhere near being the worst, and £9 gets you way more than you could reasonably expect. Even the Viet Grill's beef pho is £1 more a bowl, for example. Good food served at reasonable prices seems such an obvious thing for a restaurant to aim for that to praise anywhere for doing exactly that seems rather like congratulating the buses for running on time. But as we've all occasionally discovered to our cost in this city, and this rather credulous part of town in particular, not everwhere has their priorities in the right order. 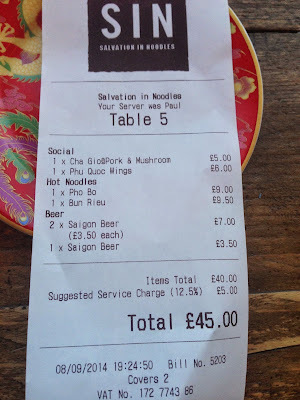 So for a bill of £45 for two people, for plenty of food and three beers, thank you Salvation in Noodles for being good enough to make me want to return. "Salvation", though, does seem a bit dramatic; may I suggest... "Satisfaction"? EDIT: Salvation In Noodles have been in touch to say that actually they are nothing to do with Soho House, the confusing seemingly arising from the fact that owner Colin Tu used to run Big Dirty Burger, no relation to Soho House's Dirty Burger. So huge apologies to Colin, and best of luck with Salvation In Noodles which surely deserves to do well.